Banapple Beef and Sausage Stew, My Comfort Food - Triple Joys!!! Last Thursday, January 15, 2015, my husband and I went to SM Aura & Market Market as we were on the lookout for a refrigerator. We took advantage of the holiday ( Papal visit). After checking one store to another, we were still not able to decide what brand to buy. :D We just decided to look again the following day. But, as we were already exhausted and hungry, we decided to eat first before going home. And as I really needed some comforting that time, I suggested that we eat in Banapple. 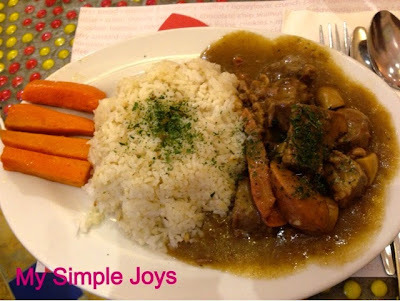 And of course, I ordered my favorite comfort food - Banapple Beef and Sausage Stew! Yum, yum! I really don't know what kind of magic does this dish gives me, but it just never fails to make me happy! The beef has always been so tender and juicy and the rich flavour of the sauce really compliments the beef. And as I am really huge in carbo, their large serving of rice really serves my tummy well! And of course, the steamed carrot, it's very delicious too - so sweet and with just the right crisp! Really can't wait to get back to Banapple again!!! 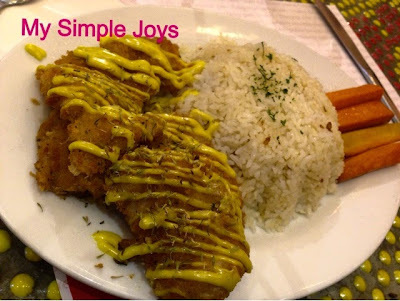 Two large portions of fish fillets covered with crispy crumbs, this dish also comes with a large serving of rice and carrots for side dish. Surely, this will satisfy one's cravings! Banapple is also famous for their savory pies! I've already tried their Creamy Chicken Pie before, and I very much enjoyed its taste!